When is the last time you saw a piece of Mother of Pearl this size? This is an NLT marked piece and a doozie at that. I think it is the nicest Mother of Pearl bowie that I have ever made. It is the only one with of Pearl big enough to make a drop down handle. It is the only time in the past 10-12 years that I have made a bowie in the style with a long clip like that. 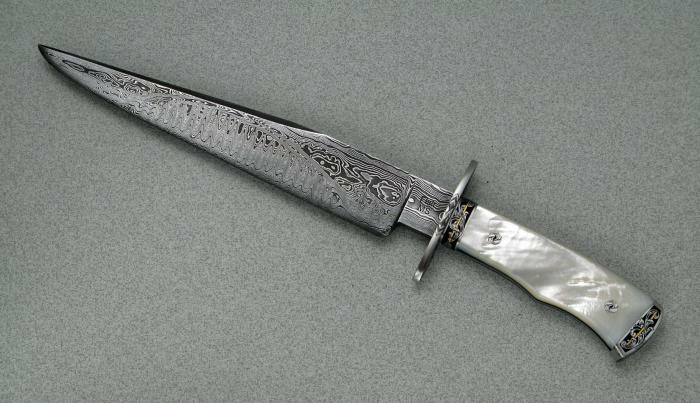 And, most likely the only time I will make a bowie with the Bridge pattern Damascus. All in all of you are looking for a nice center piece for your collection this might be the piece for you.